It seems that some scams never die and while we have not seen this one for a little while, over the last few months it has started appearing again. 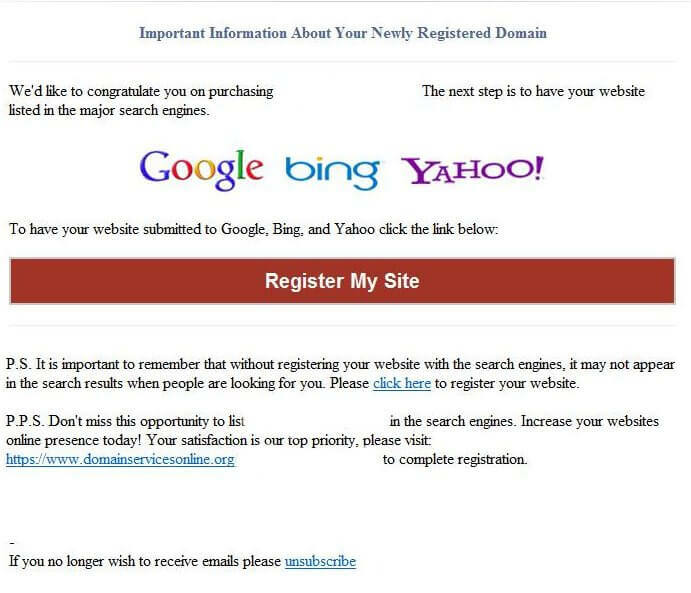 Within a few days of registering a domain name you may receive an email similar to the one shown below and then it will be followed up seven or so days later with an almost identical email. People with experience of the web and these sorts of things will normally recognise it for the unsolicited scam email that it is and ignore it but less experienced (and sometimes even the most experienced) people can easily get sucked in by this generally well worded and professional looking email. Our standard advice is to be extremely wary of any unsolicited email and you should never click on links embedded within emails like this, however, if you do and then go through to the checkout you will be asked to pay a reasonable amount of money (we have seen US$97 but there are reports of varying amounts sometimes considerably more with special discounts from higher and lower starting points !) for a service that is FREE and takes a couple of minutes, especially when you will never be able to prove whether this organisation has ever provided the “service” you are paying for. In addition to ignoring the “service” offered, we would also recommend that you dont click on the “unsubscribe” link provided – no legitimate service would send unsolicited emails and all you are likely to do by clicking on the link is to confirm that your email address is indeed a valid one and therefore worth a lot more when being sold to other email scammers. These emails are sent to contact email addresses scraped from public whois information and are sent regardless of whether the domain even has a website hosted on it ! If you wish to submit a new site to the main search engines, then you can simply visit the following two websites and enter the top url of your site. Submitting your website to these search engines guarantees nothing although it is possible that the new site will be indexed a little quicker than if you just leave it for the search engines to find by themselves. Many people believe that there is no benefit in submitting website urls like this but as Google and Bing provide the service and it takes one or two minutes there is little to lose by doing so.